A recent survey showed that Wealthfront clients are financially intentional and proactive: a winning combination that is setting them up for long-term success. We were pleased to see that the majority of our clients feel on track to meet their goals and are stashing money in emergency funds and retirement accounts. The numbers paint a really encouraging picture about our younger clients: they know how to save. Read on for more insights. Thanks to increased life expectancies, reduced Social Security benefits, and a lack of pensions, the National Institute on Retirement Security (NIRS) reports some bleak millennial savings trends: this generation may need to save 15% to 22% of their annual salaries to make it through retirement. That’s double the 10% savings rate recommended for previous generations — and the report showed that only 5% of millennials across America are meeting it. The NIRS report also found that 66.2% of millennials have nothing saved for retirement. Of the people with retirement accounts, the vast majority (82.4%) save less than 6% of their annual salary. Our clients’ annual savings rates are very encouraging — and when it comes to total amount saved to date, the data is also promising. 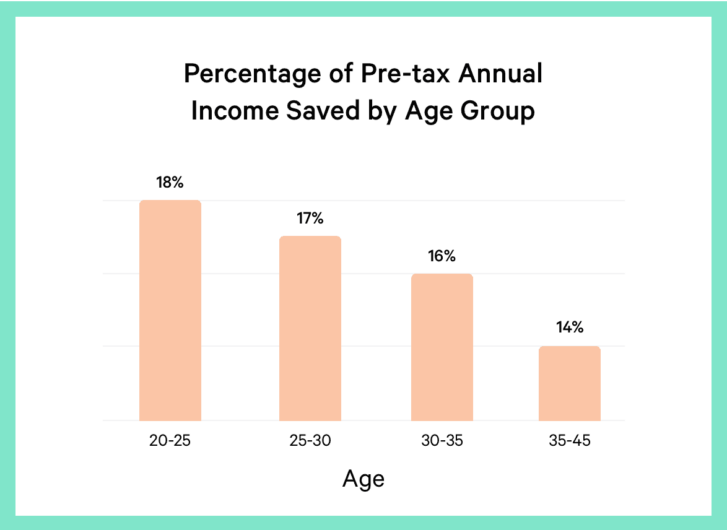 For example, our average 20 to 25-year-old client has accumulated the equivalent of 40% of their annual pre-tax salary across different types of accounts (including retirement accounts). That number rises to 50% for the 25 to 30 bracket, and 86% for those aged 30 to 35. One of the perennial rules of personal finance is to avoid “lifestyle inflation”: increasing your spending at the same rate as your earning. In other words, you shouldn’t trade your Camry for a Lexus just because you got a raise. Instead, you should increase your savings rate. Our clients adhere to that rule… to an extent. We found that savings rates increased alongside salaries until clients started making more than $135,000 per year. After that, savings rates flattened out, and then slightly decreased. This means that clients making between $120,000 and $135,000 per year saved at slightly higher rates than any other group — including those who make more than $200,000 per year. Wealthfront client Parth Patel, a 24-year-old working in financial services in Richmond, VA, follows that advice. As he’s gotten promotions and raises at work, he tries to scale his savings at a similar rate. “It’s easy to avoid lifestyle creep if your extra income goes straight to savings,” Parth says. Judging from the way young, single millennials are often portrayed in the media, you would assume they waste their money on avocado toast and designer coffee. Once again, Wealthfront clients emphatically dispel those myths. 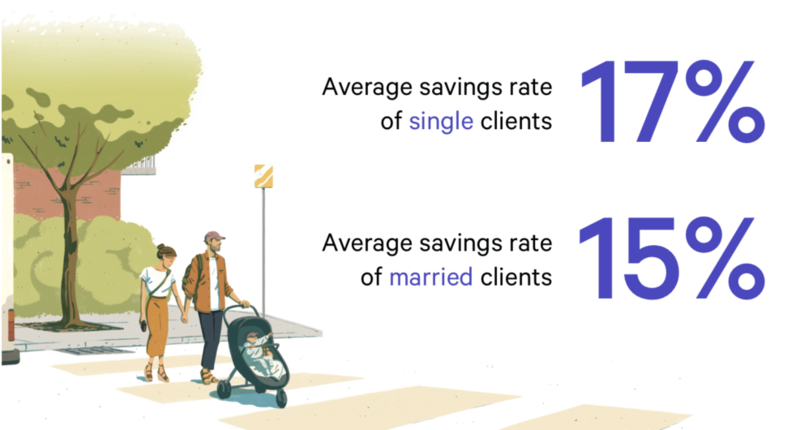 We found that, on average, our single clients save at higher rates than our married clients. Our bachelors and bachelorettes save an average of 17% of their pre-tax annual salary, a couple of percentage points higher than our married clients (15%). Our “high saver” clients — those squirreling away more than 20% of their salaries each year — are also more likely to be single. While we don’t have hard evidence as to why this is happening, our hunch is that the expenses that come with settling down — namely, paying for a wedding, buying a home, and having a child — tend to drive up expenses for a new couple. And that means their savings rate can flatten, and that their savings accounts might even take a dip. One of the key benefits for our younger clients with good savings hygiene? Time. Clients who start saving early in their adult lives will benefit from the incredible power of compounding. And the longer they use a solution like Wealthfront, the better. In fact, we found that engaging with our financial advice engine, Path, correlates to an almost 28% increase in a client’s savings rate. Learn more about starting your own savings journey here. Calculations involving percent of salary saved used median values in order to better understand the behavior of our average client and avoid positive skew due to high net worth individuals. Calculations involving savings rate used mean values, and we controlled for high influence outliers using restrictions #5 and #6. This blog is powered by Wealthfront Advisers LLC (“Wealthfront Advisers,” and the successor investment adviser to Wealthfront Inc.). The information contained in this blog is provided for general informational purposes, and nothing in this material should be construed as an investment or tax advice, a solicitation or offer, or recommendation, to buy or sell any financial product or securities. Any links provided to other server sites are offered as a matter of convenience and are not intended to imply that Wealthfront Advisers or its affiliates endorses, sponsors, promotes and/or is affiliated with the owners of or participants in those sites, or endorses any information contained on those sites, unless expressly stated otherwise. No representation or warranty, express or implied, is made or given by Wealthfront Advisers or its affiliates as to the accuracy and completeness or fairness of the information contained in the links, and no responsibility or liability is accepted for any information provided in such links. Wealthfront Advisers may from time to time publish content in this blog and/or on this site that has been created by affiliated or unaffiliated contributors. These contributors may include Wealthfront Advisers employees, other financial advisors, third-party authors who are paid a fee by Wealthfront Advisers, or other parties. Unless otherwise noted, the content of such posts does not necessarily represent the actual views or opinions of Wealthfront Advisers or any of its officers, directors, or employees. The opinions expressed by guest bloggers and/or blog interviewees are strictly their own and do not necessarily represent those of Wealthfront Advisers or any of its affiliates. Wealthfront Advisers is a SEC registered investment adviser, and a wholly owned subsidiary of Wealthfront Corporation. © 2018 Wealthfront Corporation. All rights reserved. Please read important legal disclosures about this blog.